There are two types of people in this world. The ones who start drinking coffee from an early age and develop this relationship over time, fascinated with its potential. The seconds are those who have zero interest in coffee and then have an epiphany. A cup of coffee changes everything, don’t you think? And then, there’s no turning back. No matter what style or type of coffee you prefer, every bean takes an extensive journey to make it to your cozy cup. Legend says, a goat herder Kaldi first discovered the potential of these beloved beans. The story goes that Kaldi discovered coffee when he noticed that after eating the berries from a certain tree, his goats became so energetic that they did not want to sleep at night. Kaldi reported his findings to the abbot of the local monastery, who made a drink with these berries and found that it kept him alert through the long hours of evening prayer. 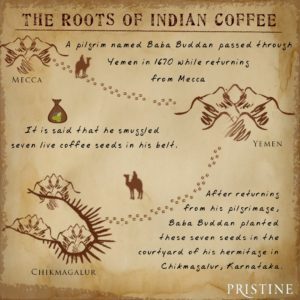 India’s coffee on the other hand, has quite an elegant origin story. Let’s explore. Coffee growing in India dates back to around 1600 AD. As the story goes, a pilgrim named Baba Buddan passed through Yemen in 1670 while returning from Mecca. It is said that he smuggled seven live coffee seeds in his belt. To set the scene, one must be mindful of how strictly export was controlled in the Middle East at that time. In fact, coffee trade was punishable by death, reasoned as such so as to retain Middle Eastern and African monopoly in the global market. However, because Baba Buddan took seven, a sacrosanct number, the act itself was considered religious. After returning from his pilgrimage, Baba Buddan planted these seven seeds in the courtyard of his hermitage in Chikmagalur, Karnataka. That folks, is the birthplace of coffee in India. And there, it thrived. The hills there now bear his name, Bababudangiri, and this till date is still an important coffee growing area. It wasn’t until the middle of the 19th century, under the British colonial rule, that coffee plantations in Southern India began to flourish. This was however, short-lived. Coffee’s popularity began to wane again. In the 1870s, the industry suffered due an increasing demand for tea, combined with an increased incidence of leaf rust, which affected the coffee plants. As a result, many plantations switched over to tea production. You know the fascinating part? Leaf rust or high tea demand didn’t drive coffee out of India. They say, what doesn’t kill you makes you stronger. All these situations churned out the infamous Coffee Board of India. Planters, curers, roaster and grinders would do as they please with a situation of the blind leading the blind playing out. The role of the Coffee Board of India was primarily for regulating the industry. What we came across even today is that some argue that by pooling coffees from many producers, the government reduced incentives for producers to improve the quality of the coffee. Secondly, they encouraged research on coffee breeds. We arrived at umpteen researches into rust-resistant varieties, resulting in new strains of coffee. This however, was before the flavour of coffee was considered to be important. Production certainly grew with India’s output increasing by a 30% in 1990s. While India has a very low per capita consumption of coffee, tea being a far cheaper option, our population is so large that the total coffee consumption is still quite large. Indian climate, altitude, soil and even-heights are indicative of growing both Arabica and Canephora (Robusta). Robusta is, in many ways, suited to India than Arabica. In India, 80% of the coffee output is of Robusta. 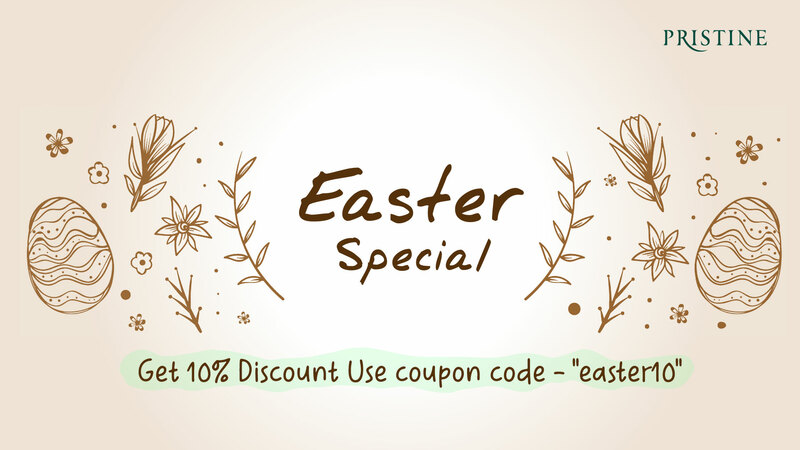 Of course, we should be proud of our Robusta’s as well, it is by far one of the most favored Robusta Coffee Beans in the Global Market today. One may wonder why. More care and attention is paid to the production of Robusta in India than any other country, so yes, we proudly occupy the premium end of the market. Even the best Robustas carry distinctive nutty, spicy, bittersweet flavors of the species, but the lack of unclean flavors (or a clean cup) in Indian Robustas, make these magical beans so popular with global roasters. That being said, the ethnicity in our Indian coffee, from bean to cup is genuinely mesmerizing. The beauty of it all is in the essence of the ‘Human Touch’ which is unlike any other. The cherry picking to the garbling, each step is taken by women & men who delicately and oh-so precisely pick out any defects or broken bits which would make way to our unclean cup. This is what gives us the liberty to call our Indian Coffee – ‘handcrafted’ just like our rich art & culture. India itself has so many coffees from single origins like Malnad, Chikmagalur, Wayanad, Shevaroys, Nilgiris, Pulney, Coorg and much more. Each one when roasted adequately to fit its taste profile, has the potential to satisfy even the most discerning coffee drinker. Before we end our origin story, one must understand the wonderful balance naturally created by coffee producers and coffee consumers. In the Global scenario, the countries around the equator or warmer countries, (India, Indonesia, Vietnam, Ethiopia, Columbia, Brazil, Honduras etc.) are where coffee is grown. This automatically makes the areas above and below the equator or the cold countries – (Canada, Russia, Australia, North Americas and Europe) – the coffee consumers. There is no doubt that this self-made coffee atlas has segregated itself to be the best coffee roasters and the best coffee producers in the world. This clarifies any uncertainty one may have had as to why coffee is the 2nd largest global trade commodity. We must be very proud to be associated with this intricate web of the Coffee World. Having said that, picture this. In India, coffee growers are in the South, that makes North India the coffee consumers. Unfortunately, that is not the case. Being North Indian, I recall knowing instant coffee powder alone. Honestly, being acquainted now with Roast & Ground coffee (or filter coffee), was probably the best thing that could have happened to my palate. Free yourself from instant coffee powders which are masked with over-powering chicory, extracted for far too long and roasted so dark that it crushes all the existing delicate flavors in the bean- that was created so painstakingly by our very own coffee planters. ‘There is a rise in cafes, but coffee consumption still stagnates’ – says the Hindu, 1st October 2018. Indian per capita consumption hasn’t budged from 100g. US is at 4kg and Finland being the highest at 9kg. A hard reality, no? We go to cafes for the ambiance, music and free Wi-Fi. Meanwhile, coffee is an after-thought, an act of unavoidability. Let us be mindful of the coffee we order next time, shall we?